New Westminster set a Canadian precedent by passing the first ever municipal living wage policy following a campaign by ACORN Canada. ACORN Canada members were thrilled with the results of the November 19th municipal elections in New Westminster, with key backers of the Living Wage Policy cruising to victory. The results showed once again that living wage policies - as well as being key poverty reduction tools - are winning positions for elected officials. Living wage champion Jaimie McEvoy won easily, increasing his vote total by 30%, proving that having the courage to enact progressive policies that support working families is rewarded on election night. ACORN Canada's membership in New Westminster launched their campaign for a Living Wage Policy in 2009 as a contribution to the broader Living Wage for Families Campaign. After engaging Coucillor McEvoy, gathering over 1500 signatures, signing up 400 new members, and pushing the campaign forward in City Council, Canada's first living wage policy was eventually passed. Local detractors attempted to use Councillor McEvoy’s support for the living wage against him in the election - charges that were shown to be baseless by election night. David Tate, ACORN's Canada National Board Representative from New Westminster said that these results prove that when you do the organizing work to engage people on issues like the living wage they and they understand the issue deeply they’ll reward you for it. ACORN Canada and Jaimie McEvoy did just that over the last 2 years and will hope to do so for years to come. The time has come for Surrey to follow the lead of New Westminster and endorse a living wage policy. A “living wage” is meant to reflect the actual income required for a two-earner, two-child household to live above the poverty line. Adopted at the civic level, it would apply to anyone working for the city. As most city staff are all already above this level, the policy is aimed at independent contractors working for the city. The living wage policy passed unanimously by New Westminster council last year will see workers paid at least $16.74 per hour. Last month, Esquimalt passed a similar policy, and the municipalities of Cowichan, Williams Lake, and Cranbrook are considering it. 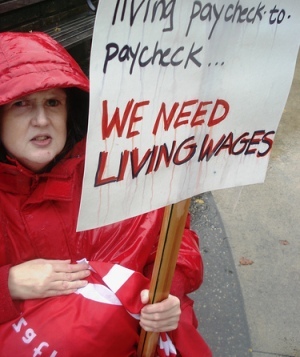 Living wage policies are currently being advocated for by ACORN Canada, the B.C. Federation of Labour, and the Canadian Centre for Policy Alternatives, the latter having recently calculated that a living wage for families is $18.17 an hour in Vancouver and $17.30 in Victoria. If Surrey were to do the right thing and endorse such a policy, it would not be the first time. In 1993, Surrey Civic Electors councillor Gary Robinson and then-mayor Bob Bose were successful in implementing a living wage for the city. At the time, Robinson explained that contractors providing flag services for the city were paying substandard wages to their employees, the majority of whom were women. A ‘living wage’ is meant to reflect the actual income required for a two-earner, two-child household to live above the poverty line. Adopted at the civic level, it would apply to anyone working for the city. As most city staff are all already above this level, the policy is aimed at independent contractors working for the city. The living wage policy passed unanimously by New Westminster Council last September will see workers paid at least $16.74 per hour. This month, Esquimalt passed a similar policy, and the municipalities of Cowichan, Williams Lake, and Cranbrook. Living wage policies are currently being advocated for by ACORN Canada, the BC Federation of Labour, and the Canadian Centre for Policy Alternatives, the latter having recently calculated that a living wage for families is $18.17 an hour in Vancouver and $17.30 in Victoria. In 1993, Surrey Civic Electors Councillor Gary Robinson and Mayor Bob Bose were successful in implementing a living wage for the city. At the time, Robinson explained that contractors providing flag services for the city were paying sub-standard wages to their employees, the majority of whom were women. SCC Councillor Bob Bose will table a motion in the next few weeks to Surrey Council to revive this idea. In April, the City of New Westminster adopted a living wage policy. Considered a first in Canada, the policy drew accolades from health and poverty groups from across the country. A living wage is often defined as being the minimum hourly wage that's necessary for a family of four, with two parents working full-time, to pay for food, shelter and other daily needs. "New Westminster is the first city in Western Canada - why not be the first city in other things as well," said Coun. Jaimie McEvoy, who proposed the policy. "The pioneers would be proud." While the details of the living wage rate were still being debated at year-end, council unanimously supported the policy. The Association of Community Organizations for Reform Now (ACORN Canada), which lobbied council to adopt a living wage bylaw, said a living wage policy brings benefits, including workers spending more money locally and businesses having less turnover and more productivity. April 26th - Today, the City Council of New Westminster British Columbia made history by voting to pass Canada's first living wage policy. BC ACORN worked with a broad coalition of over 40 organizations under the banner of "A Living Wages for Families" in pushing for the policy. Recently BC ACORN members turned in 1200 petition signatures of residents of New Westminster in support of the campaign and held a well attended forum on the subject to build public support. There are currently a number of campaigns underway across the country aimed at enacting living wage bylaws including one being spearheaded by Ottawa ACORN. New Westminster has become the first city in Canada to pass a "living wage" bylaw, effectively raising the minimum wage paid by the municipality. "New Westminster has taken a stand for working families today by setting this powerful precedent,” said Dave Tate of BC ACORN, one of 40 organizations that lobbied for the bylaw. Living wage bylaws set a wage "floor" above the minimum wage for workers who work directly for the city, for firms that receive contracts from the city, and firms that receive economic development money from the city. "Once the policy is implemented, all direct and indirect workers (contract workers, etc.) performing work on City premises will earn a wage no lower than $16.74," Tate said in an email. BC ACORN presented a petition with 1,200 signatures in support of the bylaw. The New Westminster campaign was just one of many underway across the country. A similar bylaw was recently rejected by the City of Calgary. "This gives working people hope that the tide of stagnant wages is receding in Canada," Tate said. The City of New Westminster is taking action to become the first Canadian municipality to adopt a living wage policy. A living wage is often defined as being the minimum hourly wage that's necessary for a family of four, with two parents working full-time, to pay for food, shelter and other daily needs. City council voted unanimously to establish a living wage policy. "I am very pleased," said Coun. Jaimie McEvoy, who encouraged council to adopt a living wage policy. McEvoy said the policy would apply not just to unionized city employees but to people who work at city properties on a contract basis. This includes people working in security at the library and the cafeteria at city hall. While the city doesn't yet know exactly how many people the policy will affect, McEvoy said it won't bankrupt the city. "We still have work to do to clearly identify those who are involved and the potential costs," he said. "The finality of the details still needs to be worked on. We have made a decision in principle that this is our principle and our goal. "At this point, we don't know for sure how many people it will affect," he said. McEvoy said New Westminster is a small city of 66,000 people so the policy has to be something that's manageable and is something that people can understand. The Royal City notched up one for the history books on Monday by becoming the first city in Canada to adopt a living wage bylaw. In a unanimous city council vote, a motion passed that will direct both city employees and contract employees to be paid at or above an hourly wage substantially higher than the current provincial minimum wage. The term “living wage” is used to describe the minimum hourly wage necessary for a family of four with two parents working full-time to meet the necessities of life. In Metro Vancouver, it is currently calculated to be $16.74 per hour. Coun. Jaimie McEvoy, who initially brought forward the motion, said the city was especially concerned about child poverty. The new bylaw is similar to those taken up in over 140 American cities after a recent campaign by the Association of Community Organizations for Reform Now (ACORN), whose local chapter turned in a petition to city hall with the signatures of 1200 New West residents supporting the initiative.